I'm sure you get this a lot; But we have to ask: Why did you name your Unimog Barf? Ha – I actually don’t get asked that question as much as you would think. Granted, I know it’s not a very classy name, but it makes me smile. Unimog is actually a shortened named for Univeral Motor Gerat (Universal Motor Implement). But just as often, the vehicle is referred to as a ‘Mog.’ I’m reminded of the Mel Brooks classic ‘Spaceballs’ where John Candy plays a half man/half dog – a Mog named, (you guessed it), Barf. Great movie - get it now. Makes us smile too. So then, what was your reason for getting an adventuremobile; just bored of the city? I was just bored in general. I work as a commercial director and professional photographer and, at the time of the Unimog’s purchase, had recently left a staff job at the ad agency, TBWA\Chiat\Day, that I had had since college. I found that I had some newfound free time between creative projects. I wanted a vehicle I could work on. And explore with. Sounds similar to how Up Knörth was started. So what sparked your decision to use a Unimog for your adventures; as opposed to other offroad/camper vehicles? I wasn’t really looking for an off-road camping vehicle per se. I’ve always been into driving and cross-country road trips, adventures, etc. – But honestly, I just wanted a convertible that I could take out for weekend drives on PCH (Pacific Coast Highway). Which led me to looking at Jeeps which then led me to looking at this Unimog. Offroading, camping, overlanding – all of that has been inspired by this Unimog – not vice versa. 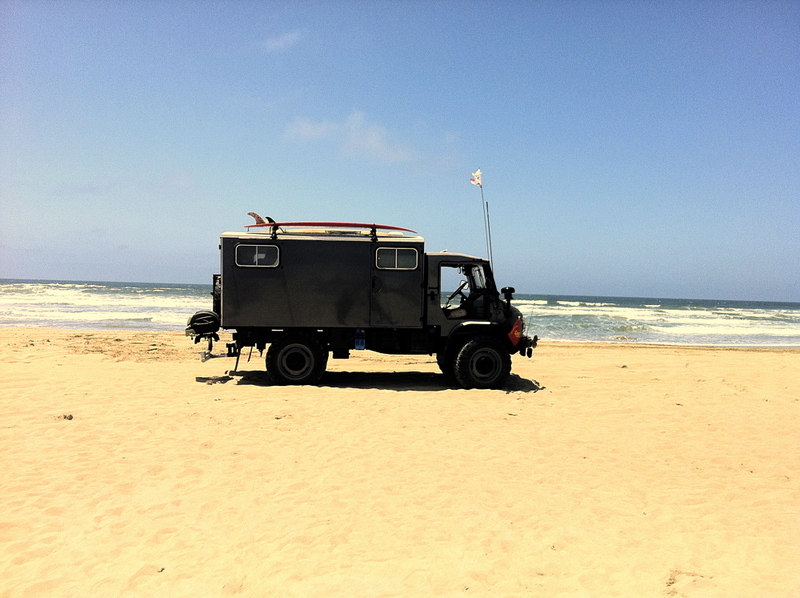 I had camped rather randomly while living in Los Angeles – but I didn’t really seek it out prior to owning the Unimog. Now, I can’t seem to get enough. Every time I return from one adventure I have to start planning the next. It’s a good thing I have an amazing girlfriend who indulges me. It's always better to have a partner in crime. What type of terrain do the two of you and Barf tackle and how reliable has she proven to be? At this point, she’s only been limited by the abilities of her driver (aka me). Everything I have thrown at her, she’s tracked incredibly well! I’ve gone offroading with her in the sand dunes of Pismo Beach, the deserts around Los Angeles and even in the mountains and the capabilities of the Unimog continue to impress me (even coming in at 8500 lbs). Not to mention handling traffic on the 405 like a pro, as well. She’s proven to be incredibly reliable and her mechanics have so far been, (knock on wood), solid. As you said the 404 was always built to be utilitarian, but what sort of customization and luxuries have you made? I’m continuing to improve and work on her. Mechanically and cosmetically, I really like trying to stick with her 1960’s roots with only a few utility modifications such as the roof rack and 2” hitch receiver. She still has her original engine, transmission and electronics and I don’t see that changing anytime soon. However, it’s the interior and the creature comforts where I depart from this ideal and decided to modernize her. The rear box is a 1963 Unimog ambulance shell which I gutted and custom made into a camper. I constructed the interior myself. From birch plywood, I crafted a dinette that folds into a full side bed, storage cabinets for food, clothing, and equipment. I have a two burner cook top set on top of a caeserstone countertop, and a refrigerator. All of this is powered by a 125watt solar panel mounted to my roof rack and two deep cycle AGM batteries. Sounds like she's made you into quite the handy-man. But enough about the highlights; bottom line what is the best and worst about Barf. It’s hard to pick my favorite feature – I guess if I had to boil it down – I was really drawn to her design – She has great lines. How many trucks of her size can you remove the roof and doors on the cab? At the end of the day, I still got the convertible I was looking for – she’s just a little bit bigger than I originally anticipated. She’s just really well designed from the exterior to the internal mechanics that create a classic timelessness to her. I have to agree there is something easy on the eyes about the rounded grill and bug eyed headlights. Where have you guys been so far? Any good stories? We’ve only had her for about 3 years, so we’ve mostly stayed within California: Pismo Beach, Oceano Dunes, Salton Sea, Truckhaven, Mt. Pinos, Yosemite National Park, Pt. Mugu, Santa Rosa, PCH and old Highway 101 down to San Diego, Coronado Island, Upper Kern River, King of the Hammers, Johnson Valley, Apple Valley. Each destination has its own story – I’ve tried to write them all down as they happen on my blog, but alas a few slip through the cracks. Any plans for future destinations? My girlfriend and I would, ideally, love to start going on longer, extended range overland trips in addition to the various weekend getaways. The plan is to try her out on a 4-5 day trip through the Mojave Trail this fall. Then, start looking at longer trips out of state – We would love to do a trip through Baja California, an offroad trip across the continental U.S. and, eventually, a trip down Argentina via the Pan-American Highway. What can one expect to find on the Uniblog? More timely updates, hopefully. I started out the blog as a way for my friends and I to share photographs and stories from the various trips we’ve gone on. A travel journal of sorts. It’s still that - but I hope to convert it to a more photo-driven site in the next few months. I love living in Los Angeles, but sometimes it’s nice to escape for a little while – I always return with a renewed appreciation for both settings and I like sharing that perspective on my blog. Top Speed: 85km/hr downhill, with the wind.